Earthtones Landscape Services offers a broad range of landscaping services for Phoenix, Scottsdale and the entire Valley. We serve commercial and residential landscaping clients, and are willing and able to take on custom landscape designs and desert landscaping projects other companies may not be able to handle. Big or small, we’ve got the right people and the right skills to get the job done properly the first time. We’re the Phoenix landscaping company you can trust. With years of experience serving clients from all over the Valley, we’ve fine-tuned the art of landscaping into a definable process that our residential and commercial clients love. We’re here to work with you on constructing the landscape of your dreams at a fair and honest price, and in a timely manner. Our landscaping services in Phoenix for our Valley customers include the following. Simply click on any of the links below for more details on that particular service. 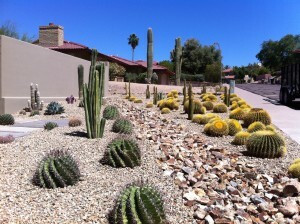 Earthtones Landscape Management is the premier landscaping services company in Phoenix, Arizona. Let our staff of professional landscapers go to work for you and craft the desert view you’ve been waiting for! Learn more about Earthtones Landscape Management here or simply contact us today and we’ll answer all of your questions and even supply you with a quote on the work you’d like done. Finding top-of-the-line Phoenix-area landscaping service providers can be a difficult task if you don’t know where to turn; Landscape Management is here to help you beautify your outdoor space with unique landscaping solutions and a team of professional landscapers that will work tirelessly for you, transforming your lawn into something you’ll enjoy every time you leave your home. My favorite cactus, The Argentine Giant! The cactus flowers bloom in the evening and only last about 24 hours. Earthtones Landscape Management is a full-service commercial and residential landscaping company in Phoenix, Arizona.